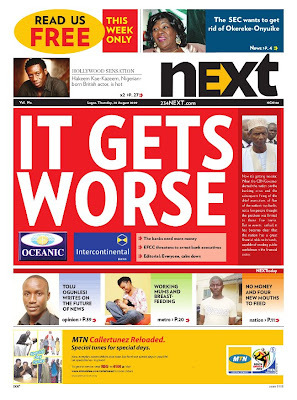 For you poor possums who don't have the luxury of living in Nigeria and getting your hands on the daily print edition of NEXT, the next best thing is to download a PDF sample every day (click on the front cover image on the homepage to download). Today's PDF sample can be downloaded here. We only get a sample? come on! So thoughtful of you! Thanks! Why are you doing us longer throat eh? Next is doing a good job sha, I read them online.